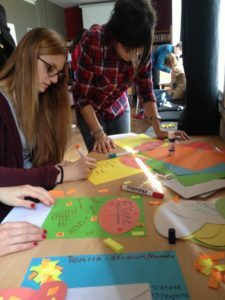 From the 16th until the 24th of April, me and Ioana Duca took part in the training “Captivating Europe” in Berlin, funded by the Erasmus + programme of the European Union. Captivating Europe was a week-long training course hosted by the organisation OneEurope. Six partner organisations from Italy, Turkey, Greece, Croatia, Lithuania and (of course, AEGEE-Europe was partner) Belgium took part in it. 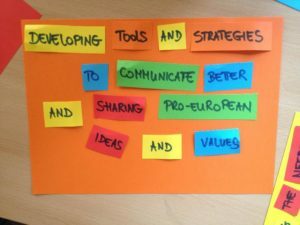 The aim of the training was to develop innovative communication strategies for the dissemination of pro-European ideas to larger audiences. Moreover, we explored European citizenship and reflected on European identity. Additionally, the project provided guidance for the programs that promote the development of European identity, for example Erasmus+. 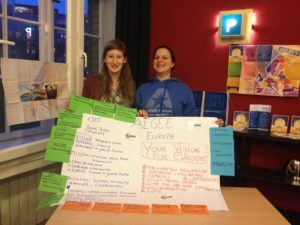 As Communications Team member of Your Vision for EUrope, I represented this project, while Ioana presented some general AEGEE materials. Since all the previous trainings I took part in were organised by AEGEE-locals (and it were never Erasmus+ projects, this was my first), it was very refreshing to participate in a training like this one. It was interesting to observe the organisation and to learn from it and to take new experiences with me on how to – and how not to – organise a project. Since we had participants from six different organisations/countries, the project was great to network and to get contacts outside of AEGEE. Afterwards I contacted some of these new contacts for the Erasmus+ application that we, the Your Vision for Europe project, submitted. I encourage AEGEE-Europe, but also AEGEE locals to (continue to) be partner organisation of other Erasmus+ projects. 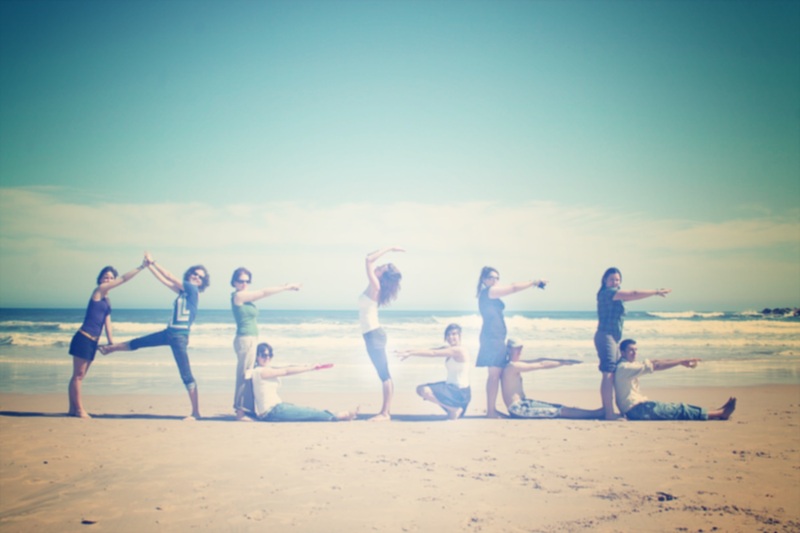 You will gather a lot of inspiration andcontacts and you will learn a lot. Even plans to cooperate in the future and to organise an Erasmus+ project together can originate from it. This is the great benefit of these kinds of projects: they offer a platform to share, discuss and network on the spot, but moreover, they bring ideas, experiences and contacts that you can benefit from later on. Besides, another reason to participate in Erasmus+ projects: travel costs and costs for the project are fully reimbursed by the EU! What do you want more? However, I have to admit that the team spirit and the atmosphere created are maybe even more important than these professional benefits. I gained a lot of new friends – outside of AEGEE. I experienced some kind of outsider perspective at AEGEE by meeting people who don’t do our typical AEGEE things, like dancing Tunak Tunak or doing our typical energisers. But, as we also have this great AEGEE network, me and Ioana met friends from AEGEE-Berlin and people from other AEGEE-locals who visited Berlin during the same period. So in short: if you have the chance to participate in an Erasmus+ project or to cooperate as partner organisation, don’t hesitate, just do it. It is a great opportunity! ← A Very Young French Antenna Organised a Magnificent Easter Event.